19855 Vintage Trace Cir, Estero, FL.| MLS# 218060358 | Southwest Florida Residential Real Estate for Sale. 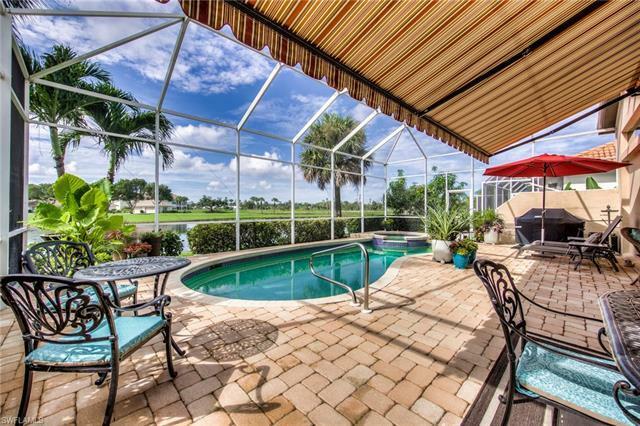 Pool home with water and golf course views in the Vines. This home offers a spacious open floor plan with 12â ceilings, tile on the diagonal, crown molding, and French doors that lead to the lanai with solar heated pool and spa. Entertain inside or out with formal dining area, eat-in kitchen, or awning covered area on the screened lanai. The kitchen was recently updated with long breakfast bar, stainless steel appliances, & abundant wood cabinets. The master features hardwood flooring, door to the lanai, large custom walk-in closet, and updated en-suite bath with dual sinks, full tiled shower, corner tub, and skylights. The hall tile flows into the updated guest bath with full tiled shower & frameless door, and pedestal cabinet sink. Guest bedroom is welcoming with warm wood flooring and bayed windows. Social membership to the Estero County Club is required but affordable in one of the friendliest communities in the area. The club offers formal & casual dining, bar, tennis, pickleball, and many social activities. Golf memberships available for newly renovated Gordon Lewis 18 hole championship course. Priced to sell and move â in ready. This home wonât last long!